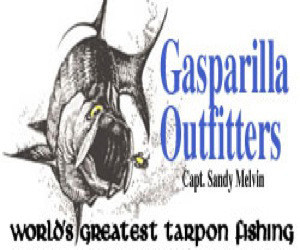 This Saturday, June 2, approximately 40 boats will head out to the Pass filled with children who are ready to have a great day on the water, hopefully catch some nice tarpon and possibly win some great prizes. 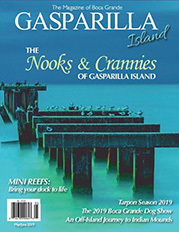 In the past seven years the anglers, ranging in age from about six to the age limit of 15, have caught and released 112 tarpon, with an average release time of nine minutes. 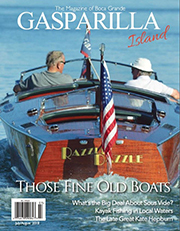 Head Judge Smitty Smith will man the microphone and the leaderboard up in the Port Boca Grande Lighthouse, and the Boca Beacon will be there as well to give real-time release results on the Gasparilla Island Kids Classic Facebook page. Just prior to the beginning of fishing at 5:30 p.m. a ceremony on the beach will include a message from Lemon Bay Conservancy, a blessing of the fleet, the Presentation of Colors by the Lemon Bay ROTC and a flyover by the Charlotte County Warbirds. Fishing will conclude at 8:30 p.m., and the awards ceremony will take place on the grounds of the Boca Grande Community Center after the tournament. The first place team will receive MacBook Air tablets and their captain will receive $1,200. The second place team will receive iPad Pros and their captain will receive $800. The third place team with the last fish released will win GoPro Hero6 cameras and their captain will receive $500. 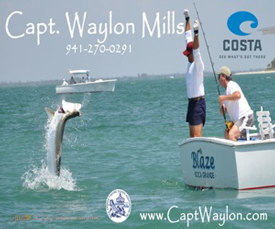 There is also a raffle for the captains, and each fish their team releases will mean an entry into a hat for them. The captain whose name is pulled at the end of the night will win a $3,000 cash prize, courtesy of Stump Pass Marina and Grille. 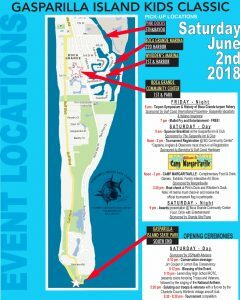 The fun begins at 11 a.m. on Saturday on the grounds of the Boca Grande Community Center with “Camp Margaritaville,” sponsored by Margaritaville Radio, which includes the family interactive art show. 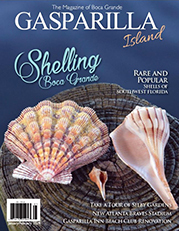 Local artist Carroll Swayze will give kids the opportunity to make some amazing nautical crafts, and there will be food and drink as well. This event is not just for anglers, everyone is encouraged to bring their kids down for a great time, and to experience some of the silver king excitement that surrounds the event. Tournament registration begins at noon. Everyone should make sure they have checked in at the pavilion to get their team bags and shirts, and to confirm where and when to meet their captains. “We hope everyone will bring their kids to Camp Margaritaville and enjoy a fun day of food, games and crafts,” Melvin said. 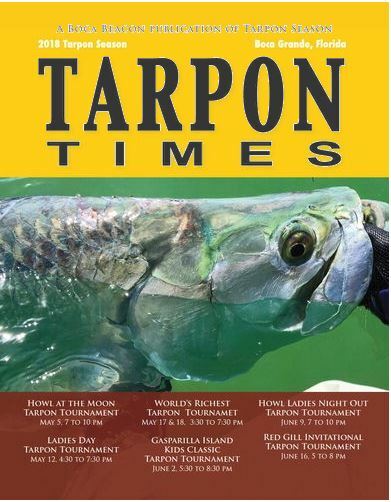 On Friday, June 1 a tarpon symposium will be held in the Boca Grande Community Center Auditorium at 6 p.m. Dr. Aaron Adams with Bonefish & Tarpon Trust will give a presentation about the science of tarpon and why they seem to love our island waters. Then Capt. 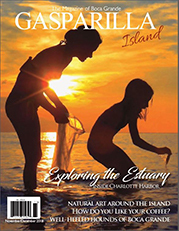 Nat Italiano and multi-generational islander Betsy Joiner will talk about the history of Boca Grande tarpon fishing. The presentation will be followed by something you probably haven’t seen around these parts in a long time – a traditional Florida mullet fry, complete with all the fixings. There will be live entertainment as well. 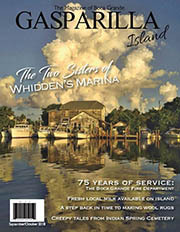 The event is free to everyone, but donations for the Boca Grande Historical Society are welcome. 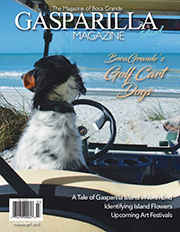 The Gasparilla Island Kids Classic is coordinated through Boca Grande Charities, Inc., a non-profit group that consists of Melvin, islander Bill Klettke and Michael Vaughn. 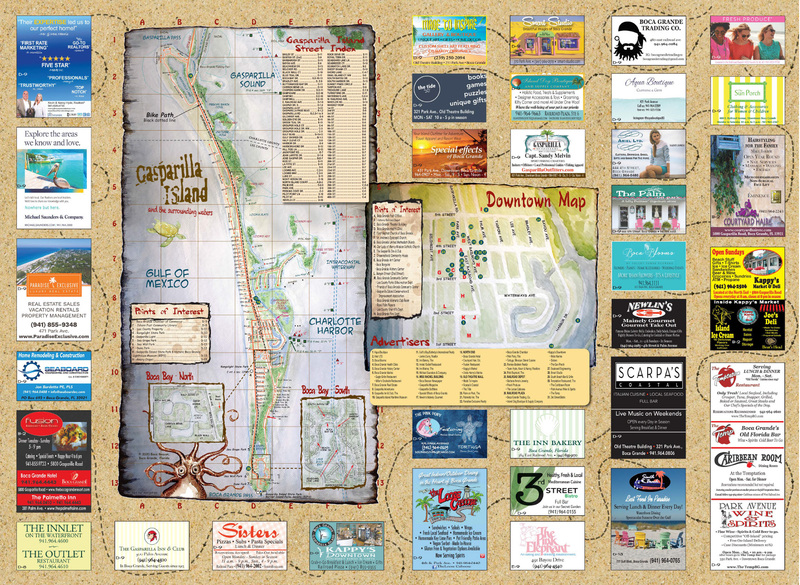 It is presented by platinum sponsors Columbia Sportswear, Margaritaville and U.S. Health Advisors. Proceeds support local education by partnering with Charlotte County schools to create a two-week S.T.E.M. 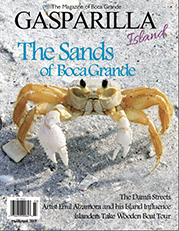 (Science,Technology, Engineering, Math) camp each year, where about 80 percent of the money needed to run the camp comes from Boca Grande Charities. Other children’s organizations that will benefit from the proceeds of this year’s tournament include Easter Seals Project Rainbow, the Dee Wheeler Scholarship Program on the island and All-Children’s Hospital Music Therapy Program. 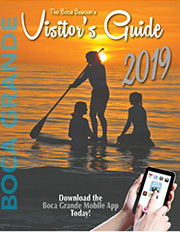 In the history of the tournaments – including the expected earnings from this year’s event – Boca Grande Charities will have raised more than $200,000 for children’s programs in Southwest Florida over the eight years it has been in existence. You can listen in to more tournament action on Saturday on Margaritaville music on Siriusxm. Camp Margaritaville action will also be covered by the Boca Beacon and Boca Grande TV, so stay tuned!